GLENDALE, ARIZONA -- Phoenix Coyotes General Manager Michael Barnett announced today that the Coyotes have signed college free agent forward Bill Thomas to an entry-level contract. The 6-foot-1, 185-pound right wing joins the Coyotes after two amazing seasons at the University of Nebraska-Omaha of the Central Collegiate Hockey Association (CCHA). This season with Nebraska-Omaha, Thomas collected 27 goals, 23 assists and 50 points in 41 games and earned CCHA First Team All-Conference honors. He led the entire CCHA in goals scored, ranked 4th in points and finished tied for 13th in assists. Among all NCAA Division I players, Thomas ranked tied for 5th in goals and tied for 15th in points. He also led his team in goals and power play goals (8), and finished tied for 1st in game winning goals (3), 2nd in points and 3rd in assists. "We are very pleased with this free agent signing," said Barnett. "Bill Thomas has been a dominant player for the past two seasons. Finding more scoring power is a priority in our organization. Consequently, we've had people watching him play many games over the last 12 months. Because of his free agent status, scouts were always abundant at his games. We feel fortunate that Bill is now in our fold." 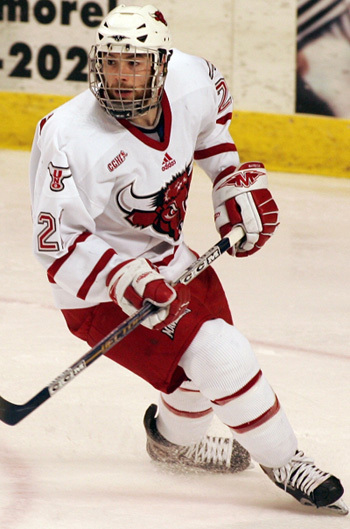 In 2004-05, his freshman year with Nebraska-Omaha, Thomas registered 19 goals, 26 assists and 45 points in 39 games. He led the entire nation in scoring among freshman and earned the CCHA Rookie of the Year. The Pittsburgh, Pennsylvania native was also named to the CCHA All Rookie Team and to the CCHA All-Conference Second Team. "I'm real excited about the opportunity and hope everything works out well," said Thomas. "It was a tough decision to leave school. I will be forever grateful to the school and my coaches there. Once I made the decision to turn pro, the Coyotes were one of the teams that immediately showed a great deal of interest in me. I had a real good feeling in talking with everyone within the Coyotes organization and felt this was the right fit for me. And obviously the opportunity to play for Wayne Gretzky was a big factor in my decision. It will be a huge honor for me to play for the Phoenix Coyotes." Also in his rookie season, Thomas finished tied for the team lead in goals and 2nd in points (one shy of the team lead) and assists. Thomas also led his team in power play goals (9) and tallied a 9-game point streak. Among all CCHA players, he ranked tied for 6th in scoring and tied for 9th in goals. On three different occasions, Thomas was named the CCHA Rookie of the Week. "Bill Thomas has been a consistent goal scorer in both junior and college hockey over the last four years," said Tom Kurvers, the Coyotes' director of player personnel. "He was named First Team All-CCHA and was a key member of his team as Nebraska-Omaha qualified for the NCAA Tournament. Bill was a highly regarded free agent pursued by a number of NHL teams." The 22-year-old Thomas did not miss a single game during his collegiate career, playing in all 41 games in 2005-06 and all 39 games in 2004-05. Prior to joining the collegiate ranks, Thomas played for the Tri-City Storm of the United States Hockey League (USHL). He led the team in scoring in 2003-04, collecting 31-38-69 in 60 games. Thomas played in USHL All-Star Game and earned Tri-City's team MVP award. He also led the entire USHL in playoff scoring that season with 8-6-14 in 9 games. "I have to give the Phoenix Coyotes organization a lot of credit with their pursuit of Bill since his college season ended," said Thomas' agent Wade Arnott of Newport Sports. "They went about things the right way with a great deal of professionalism and that was a big factor in Bill's decision to choose Phoenix. The Coyotes are a perfect fit for what Bill was looking for. He is excited about being a part of a good group of young players moving forward."